Hey Portians! Today we’d like to share some details with you about one of the new systems we’ve been working on…The jealousy system! 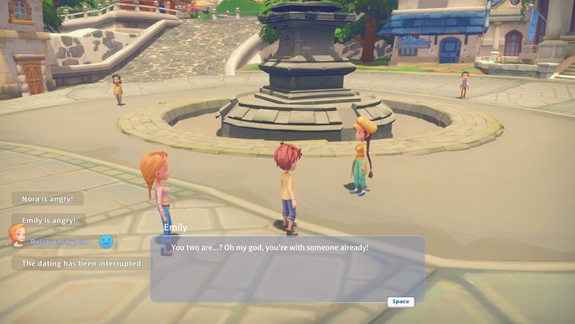 Right now, as some of you might know, it’s possible to date more than one person at the same time in Portia. 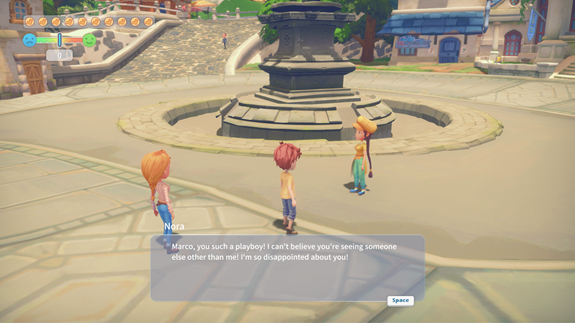 We’ve since decided we’d like to give dating in Portia more depth, so we’ve started to work a jealousy system into the game. When you share your feelings with someone and he/she accepts it, you’ll enter into a romantic relationship with that person. You’ll hang out and spend quality time together, as you’d expect! However, if you’re out with one partner and another one of your dates get to see you dating someone else…well…there’ll be trouble as jealousy erupts! So what’s the result of all this? Well firstly it’ll interrupt your date as the jealous individual storms over to you. Then you’ll be confronted and things will start to get embarrassing for you. Following on from that initial encounter your relationships with these two NPCs will be negatively impacted and you won’t be able to perform daily talks with them (regular mission conversation will not be affected). You’ll need to spend seven days of jealousy time with them toatone for your behavior. If you want to speed up the healing process, rather than spend seven days atoning, you’ll have the option to complete some tasks for them or gift them some presents. 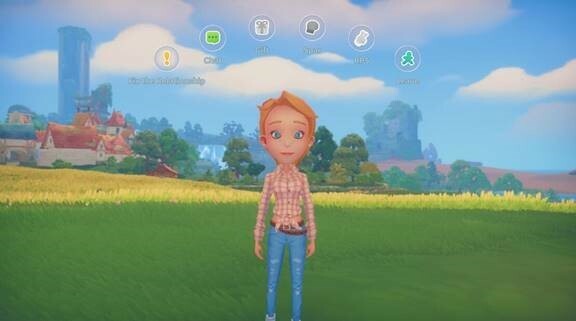 We’re not encouraging players to cheat, we are however giving players the freedom to do as they please when it comes to forming bonds in My Time at Portia, you’ll just need to consider the consequences of your actions. One extreme example of this is if you’re in a relationship with a large portion of the town and they all come to confront you when you’re on a date, that’s going to cause quite the spectacle…You should probably start running too. When will jealousy be in-game? The jealousy system is still a work in progress, with most features being released when version 4.0 launches, however Kickstarter Backers should keep an eye out for early additions of the jealousy system in version 3.5 as we’re hoping to get this new feature working as soon as possible.